This antojito is one of the most popular ways of eating plantain in Mexico. This simple dish has a sensational flavor as it combines plantain’s sweet flavor with its own browned and smoky flavor that is generated when it is fried. When you taste it you will look forward to accompany more and more Mexican dishes with this delicious appetizer. *In Mexico the plantain tendency is that it is only used in the cuisines of some Mexican regions. It is an especillay popular ingredient in the southern states like Veracruz, Tabasco, Chiapas and Oaxaca. The fried plantain can be served plain as entree plate. They can also be served mixed with white rice , red rice , garlic shrimps , Mexican rice or with any other dish of your liking. The other option is to serve them as garnish of diverse main courses, mainly in dishes that have beef or mole. The best about this recipe is that it is very cheap and anyone can do it. Use vegetable oil to fry the plantain because it stands high temperatures, it helps the plantain not to get burned and it doesn’t give any flavor to the dish. When you choose the plantain, look for one that has a black peel as this indicates that it is ripe and sweet. Don’t prepare this recipe with regular banana because it loses its consistency. This recipe serves 2 plates. Cut the plantain that was peeled into diagonal slices of approximately .2’’ thick, then reserve. Put in the frying pan the plantain slices that were cut and fry them for about 2 minutes per each side, until they are moderately fried. Don’t get scared when the plantain slices are put in the oil because many bubbles will pop-up. Transfer from the frying pan to some paper towels, with the tongs, the fried plantain slices so they dry and the fat excess is absorbed. Tip: Put some lime to these plantains they taste exquisite. Recommendation: If the fried plains are served as snack sprinkle some grated fresh cheese over them, it will give them more presentation and flavor. 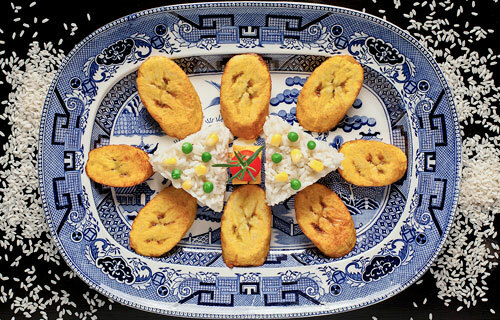 Variation: This dish also exists in dessert version – fried plantains with cream. Did you like the Fried Plantain? It is a bit crazy to spend so much in a skillet... but with “The Woll Titanium Skillet" it can be reconsidered. The heat distribution is perfect, the food doesn’t stick and it doesn’t release intoxicants. It truly is a work of art. Measure to perfection the ingredients that you use in your recipes, in a very innovative way with this “Adjustable Measuring Cup". Measuring won’t be what it was. While you cook have fun playing with a Mexican balero.